Ride and Read! NEWS by Madness Photography - Onno "Berserk" Wieringa: Matt Hotch and Rocky Robinson Special Guests at Corbin’s 3rd Annual Rider Appreciation Day. Matt Hotch and Rocky Robinson Special Guests at Corbin’s 3rd Annual Rider Appreciation Day. 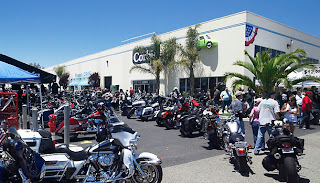 Corbin announced today (June 24th) that Two-Time Biker Build-Off Champion Matt Hotch is coming up from Southern California to attend Corbin’s 3rd Annual Rider Appreciation Day as well as the world land speed record holder Rocky Robinson and his twenty-one foot record holding streamliner Ack Attack. In addition to being an author and lifetime member of the 300mph club, Rocky is the current holder of the Unlimited Motorcycle World Land Speed Record... a distinction he's earned more than once! For those who don’t follow such things, Rocky and Crew upped the ante for the World’s Fastest Motorcycle to over 376mph (two way average) in September of 2010. The effort netted a top speed of 394mph in their race for the record. Rocky will be on hand to answer questions along with the record holding 376+ mph engineering marvel Ack Attack streamliner. There will be tons of live entertainment throughout the day including music from The Backyard Blues Band as well as Jay Gordon (formerly Jay Gordon and the Penetrators) Blues / Blues Rock Band. Hollister is the Birthplace of the American Biker…it’s where it all began! Last year, Corbin had thousands of riders show up to help celebrate our country’s birthday and take part in the festivities. 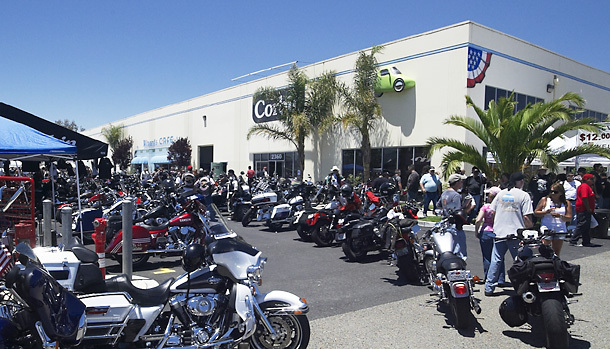 This year Corbin, an industry leader, is also having a trade show right on their property and many of the more recognized names in the industry that will be there: Samson Exhaust, Barnett Clutches, Renegade Classics, Mid-USA, Arlen Ness, Custom Chrome Inc., IronWorks Magazine, Ride Wright Wheels, Cycle Gear…And many, many more! Corbin is working with Bob Warford, also known as Biker Bob to his many radio listening fans, to put on another bike show this year. Biker Bob will emcee the bike show and promises this year will be bigger and better with special goodies being handed out to the winners. Corbin is inviting all of you to enter FREE of charge! You've put a lot of work into your bike and here's your chance to garner a little attention for all of your efforts. Not just attention, but a nifty trophy or award to boot! This year, there is a special twist to the Corbin Bike Show…The founder and managing editor of IronWorks Magazine, Marilyn Stemp, will be on hand to lend her expert eye to the judging and will personally present the IronWorks Trophy! The Winner will not only receive this special honor, but will also have their bike featured in an upcoming issue of IronWorks Magazine. • Free Installation- In addition to the Discount, all Corbin accessories are eligible for free installation. Get your new saddle and ride home on it! Labels: Matt Hotch and Rocky Robinson Special Guests at Corbin’s 3rd Annual Rider Appreciation Day.